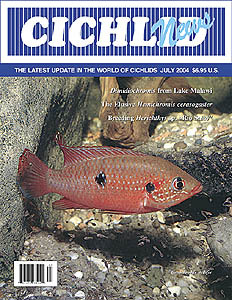 The Cichlids of the Genus Dimidiochromisby Ad Konings. Striking predators from Lake Malawi for your home aquarium. The Elusive and Enigmatic Hemichromis cerasogaster (Boulenger, 1899) by Randall Kohn. Welcoming a new addition to the “jewels” of West Africa. Breeding Herichthys sp. “Rio Salto” by Dan Woodland. Natural history and husbandry of a new species from Veracruz, Mexico. Tilapia ruweti: a Dwarf Amongst Giants by Nick James. Tilapias aren’t just good eating! Two New Dwarf Cichlids from Peru by Uwe Römer.